A Wandering Botanist: Visiting Northern California: Flowering Agaves! Visiting Northern California: Flowering Agaves! Agaves (asparagus family, Asparagaceae) are a fascinating group of plants. Many have a life cycle in which they grow as a cluster of leaves (rosette) for years, then send up one huge flowering stalk. The tall stalk produces lots of flowers and seeds, using all the energy stored by the plant over the years. When the seeds are ripe, the exhausted plant dies. 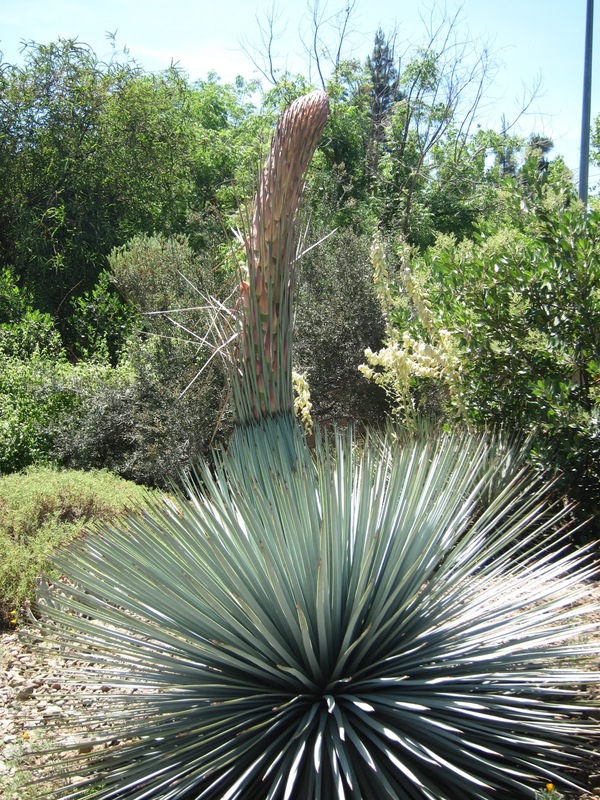 An hour east of San Francisco in the Ruth Bancroft Garden in Walnut Creek, big agaves were flowering in mid-May, 2013. Wow! Agaves, for example Agave americana, are called the century plants. 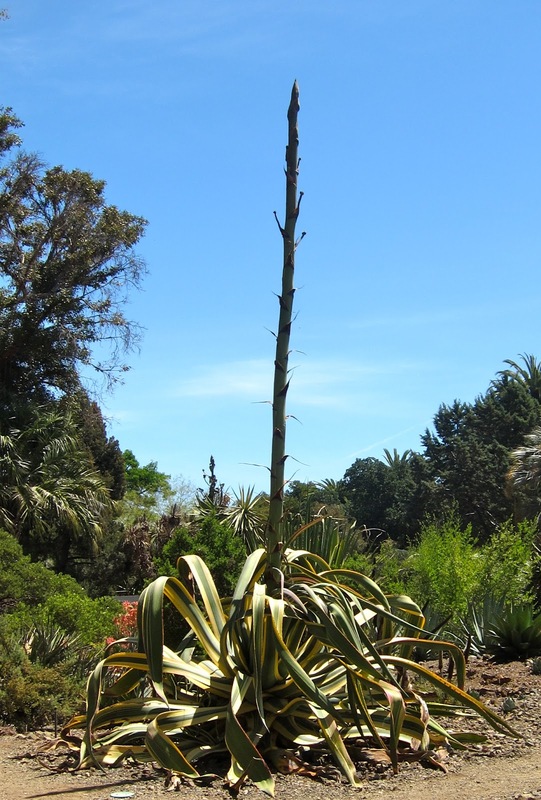 However, as staff member Carol Babst pointed out, the century plant name is a misnomer, since agaves rarely live more than 25 years. You might not know how old your apple tree or lilac bush was when it died, but since the agaves flower so dramatically and die, people pay attention to their age. The flowering stalk is spectacular--10 or more feet high. But equally impressive is that after waiting 15 or 25 years--a long time to wait to flower!--the plants dies. One time to flower only. It seemed to me that a lot of agaves were blooming at Ruth Bancroft Garden and Carol agreed, saying that an impressive 26 individuals were in bloom. I asked "why are so many of your agaves blooming this year?" and learned: nobody knows. There was no obvious environmental trigger and the plants were not the same age. appreciate the size of the plants. Reproducing once in a lifetime and then dying is called monocarpy. The term for animals is semelparity and the animal term gets used if you want to talk about animals and plants at once. Once-in-a-lifetime reproduction is very rare in animals--salmon and 17-year cicadas would be examples--and rare in plants. (I am discounting annuals, animals and plants that die when the season changes, leaving their eggs or seeds to replace them the next spring or next rainy season). Most plants and animals that live longer than one year are polycarpic (iteroparous to a zoologist), reproducing repeatedly as adults, assuming they live to do so. As monocarps, agaves belong to a distinctive group of plants that spend a few or many years storing energy, to reproduce all in a single year and then die. The observer marvels at risking all on a single year. What if no other plants of that species flower that year? There might be no pollination for the flowers. What if there's a drought or flood or unusual frost? All the seeds from a lifetime might be killed. Those are reasons why most plants are not monocarpic (are polycarpic). Repeated reproduction spreads the risk. But monocarpic agaves, bamboos and evening primroses exist and thrive, so in the right habitat this life style not only works but works well. One benefit of monocarpy is making many seeds. To survive to the next year, a plant needs to store a fair amount of energy. In harsh environments, holding energy to survive until this time next year may greatly reduce the number of seeds the plant can produce. So the monocarpic plant can make more seeds in its one year than the polycarpic plant does in two or three years of reproducing. Furthermore, even some healthy plants die before their second try at reproduction and if mortality is high, whether or not plants carefully reserve energy for the future, then the monocarpic life history is the more effective. (Biological jargon I've been side-stepping: patterns of reproduction are called life histories and, especially, life history strategies, even though the plant or animal responds to its genes, it doesn't actually have a strategy. Agaves have a monocarpic life history strategy). Another benefit of a monocarpic life history strategy may be the dramatic display. 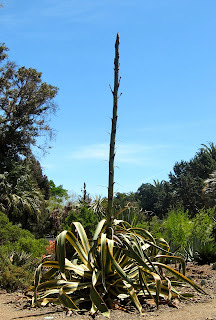 The tall flowering stalk of agaves can be seen for a long way (see photos!). Pollinators and seed-dispersers can easily spot it and come to it. A two- or three-foot stalk is much more easily missed. But it takes substantial energy to send up a towering flowering stalk. And, finally, when it works, putting out lots of seeds at long intervals can result in seed-eater (predator) satiation. The local birds, mice and insects gobble down all the seeds they can, but the plant has so many that some slip into safe spots in the soil before they are found. If there had been fewer seeds, they might have all been found and eaten. Whatever the benefits--and they are probably different for different species--most agaves are monocarpic, making a big flowering display after some years, and then dying. 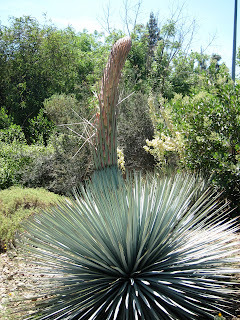 At the Ruth Bancroft Garden, there were an unusual number of agaves flowering. As my pictures show, most were just starting their flowering push in mid May. Flowering for 20 year old agaves is a big project--they will be at it much of the summer. There are other monocarpic plants. The most dramatic displays are often on desert species, but other plants are monocarpic, for example most bamboos (several genera, grass family, Poaceae), some thistles such as wavy leaf thistle Cirsium undulatum of the plains of Nebraska and Colorado (sunflower family, Asteraceae), carrots (Daucus carrota, dill family Apiaceae) and the common evening primrose of the eastern U.S., Oenothera biennis (evening primrose family, Onagraceae), among others. Google Images shows some others: monocarpic species. The extreme monocarpic plants invest only in seeds, flowering explosively after 2 or 30 years and then die. Many more species, while monocarpic, have some method to mitigate the risks inherent in flowering only once in a lifetime. Some form a clone of rosettes during their life, so the flowering plant dies but its clones live on. Many agaves form bulbils--tiny green plants, clones of the parent--up on the tall flower stalk if the flowers are not pollinated. When the flower stalk falls over, the bulbils fall to the ground, now several feet from the parent, and carry on as if they were seedlings. Any way you look at it, agaves have a dramatic life history. I cannot find a popular essay describing semelparity/monocarpy generally. Which is too bad because, as you see, I think it a fascinating life history. Arizaga, S. and E. Ezcurra. 1995. Insurance against reproductive failure in a semelparous plant: bulbil formation in Agave macroacantha flowering stalks. Oecologia 101: 329-334. Futuyma, D. J. 1997. Evolutionary biology. 3rd ed. Sinauer Associates, Sunderland, MA. pp. 568-571. Janzen, D.H. 1976 Why bamboos wait so long to flower. Annual Review of Ecology and Systematics. 7: 347-391. A classic. Agave Americana is a famous plant that has many medicinal values, Thank you for giving this valuable information.